Pulvermacher also known as "Tischlerhäusl"
Landhaus Pulvermacher was also known as “Tischlerhäusel”, which means translated carpenter’s house. After the 1st house burned down. The former own master carpenter Sieberer reconstructed it in 1926. Sieberer got into a financial dilemma and the “Tyrolienne Mortgage Bank” took over the property. June 1st 1938 Anton Openeiger and Elise Schiefer aquired the object and the associated lumber acquisition right in an auction by the regional court of Radstadt for the price of 6.222,22 Reichsmark. Miss Schiefer and Mr Openeiger got married, however Elise died in autumn 1944. Mr Openeiger sold the object to Mr and Mrs Adam Geringer and Misses Funi Turner, born Steiner. She passed on her share of the land to Hans and Kathi Steiner. In addition to other loggers, the family Matthias and Victoria Steiner and their living children Herbert, Dorothea and Margit were occupying a flat in the house until 1962. 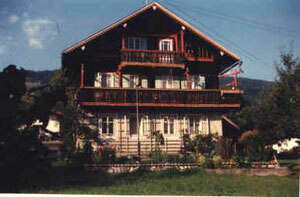 On August 1st 1977 Anton Openeiger sold the “Landhaus Pulvermacher” to Dorothea Krings, born Steiner.